TERMIDOR termite treatment has been on the market in Australia since 2002 and has quickly become the most effective termite barrier control product because it works! 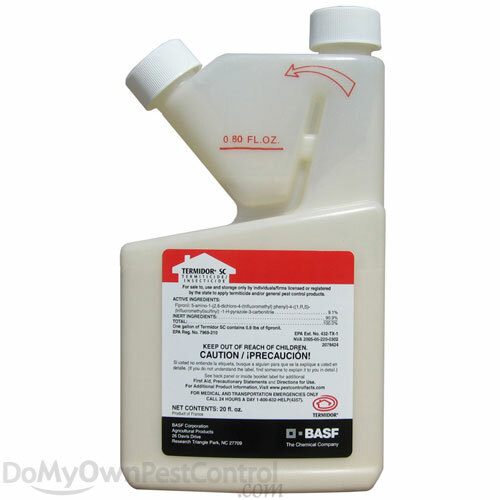 Termidor is a non repellent chemical termitcide. This has a huge advantage over the repellent teriticides that are supposed toprevent termite entry but termites only need the slightest of gaps in a repellent barrier to gain access to your home. They are masters at detecting a break in the barrier no matter how small. Termidor on the other hand is non repellent meaning the termites can’t detect it and consequently move through the chemical, picking it up and taking it back to the colony. Termites exposed to lower concentrates of Termidor don’t detect the chemical and will continue to forage through the affected soil unaware that they have been. If they come into contact with the stronger applied chemical then they will die on contact. Termites that have come into contact with Termidor can then transfer it to other termites in the nest that havn’t come into contact with it. This is called the “transfer effect” and occurs when Termidor binds to the cuticle of the termite. Termidor can cause the entire termite cvolony to be killed off. Termites may take weeks to die depending upon the concentrate of Termidor that the termites have been exposed to. WHERE TO APPLY TERMIDOR TERMITE TREATMENT INSIDE HOME? TERMIDOR is applied to the soil around your home. Traditionally these types of applications are referred to as chemical barriers, although in the case of Termidor, the chemical does not act in the same way as many older chemicals because it is a non repellent. Once dry and bonded with the soil termidor is a safe chemical that is odourless and water based. Once applied to the soil the chemical will move through the soil and away from the building creating a buffer that has a decreased concentration of chemical in the soil the further it is from the building. It is essential that the chemical be applied at the correct rate to have maximum impact on the termites. Termidor is one of the most tested termite chemicals on the market. It has been tested in all states of Australia and has proven to be a winner every time. When tests were carried out it was found that control of termites can happen in as little as five to nine weeks. When applied at the correct rate Termidor has a life span of up to eight years which is real peace of mind for the home owner. Find Residential & Commercial Pest Control Services in Abu Dhabi. Exterminator's Guide to Rid of Termites Effectively! Copyright © 2013 Termite Treatment. All Rights Reserved.